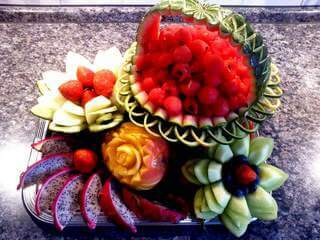 How to choose and store fruits for carving, you can learn from our article. Master the intricate carvings - carving, can be anyone. Sufficient patience and a little practice. Before proceeding to the creation of masterpieces, seriously consider the selection of raw materials. 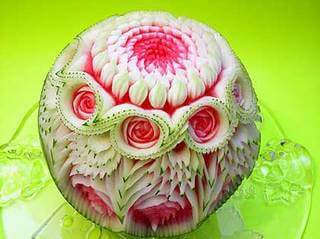 Properly chosen vegetables, even in the absence of professional tools will help to create a real beauty. 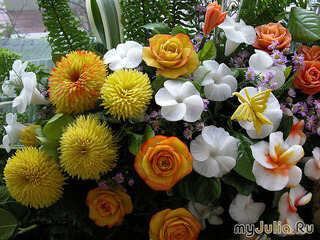 Прежде we proceed to action, it is necessary to examine the theoretical basis. 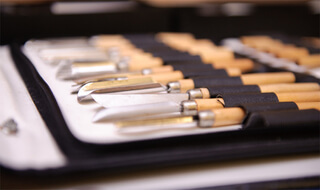 Received theoretical training in the form of photo and video materials, you need to acquire the necessary tools and knives for carving, then you can safely proceed to the most interesting process. 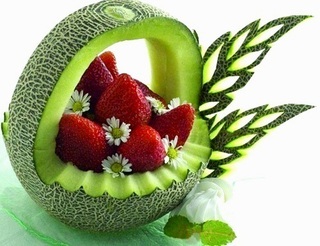 Now that you are familiar with the highlights: how to choose vegetables for carving, how to choose fruit, what kind of knives and tools need to create carving works, you can go to a no less important issues for the preparation of products for carving. Swans from apples - simple! Apple carving. Piecemeal excision of swans red apple. 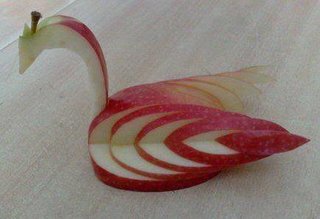 To create a swan from an apple you will need: a thin knife, Swans of apples - simple! Apple, serving dishes. Carving flowers. Appetizing bright rose of tomato. And now, you already know how to work with a bow and make it awesome onion flowers, today we will tell and, moreover, show you how to make an attractive bright flower of tomato. Making funny turtle eggplant and zucchini. For the manufacture of edible vegetable turtles you will need: a large eggplant 2 small zucchini, carrots Korean, serving dish, sharp knife. 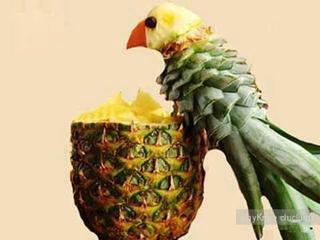 If you want to make children's holiday a truly vivid and unforgettable , you can use our step by step directions to build and own a fun bright parrot sweet juicy pineapple. When the morning starts with happy moments, it promises us a good continuation of the day! 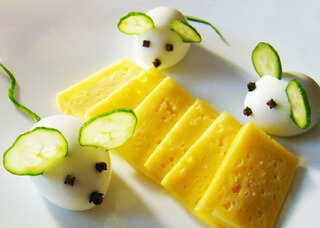 If you want to give your family a good mood and joy in the morning, try to make fun of mice for breakfast. Use any of the products of your choice, dream and experiment, combining different ingredients. Shay Aaron is a brilliant artist from Israel who makes the most astonishing miniature food jewelry. These foodstuffs look so beautiful that we would desire to eat them. Actually, there’s a whole market out there for miniature food. Not actual stuff you can eat, but beautifully hand made designs of steaks, burgers, pies, vegetables, eggs and pretty much anything you can think of. 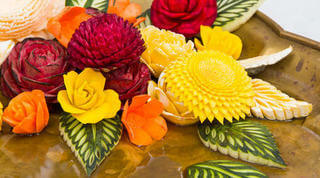 Carving can be stone, wood,History of carving bone, and in other matters, according to any cutting materials. It is worth noting that the carving is firmly entrenched in cooking. 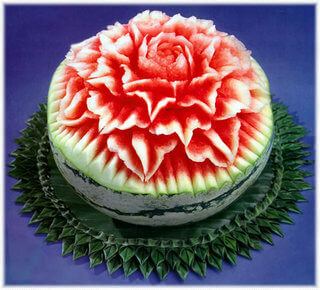 So, culinary carving we can characterize as art artistic cutting of vegetables, cheese, fruit and other products.